It’s that time of year again! With UVA students making their way back to school, Seminole Trail Volunteer Fire Department is looking to add even more students to its ranks. About 60% of the active members at STVFD are either past or current students, making the fall recruitment events very important for the department. Fall recruitment actually begins in the early summer and is a culmination of a lot of volunteers’ hard work and planning. However, once the students come back for the fall semester the real work begins. Around 12 volunteers from STVFD attended the student activities fair held on UVA grounds this fall. 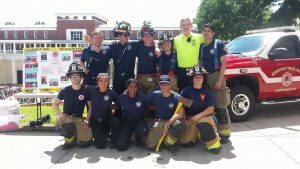 They handed out fliers, wore full gear in sweltering heat, and talked to interested students about what really sets the station apart from other volunteer organizations. These 12 hardworking volunteers received almost 200 names of students who were interested in learning about the department. The next element of fall recruitment is the open house. This year the open house was the largest it’s ever been. We had about 20 volunteers assisting with the event and over 35 potential members visit the station! At the open house, members of STVFD showcased basic skills we use in the department. This year we were able to bail out of our new Conex box training building, break glass in an extrication scenario and demonstrate our proficient use of ladders and hoselines. 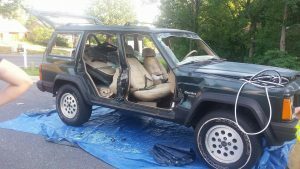 After the skill demonstration, the students broke into smaller groups and received lectures and some hands on experience with flowing a handline, medical equipment, vehicle extrication and ladders. After the breakout sessions students were given instruction on how to join the brigade as well as refreshments and pizza (of course). 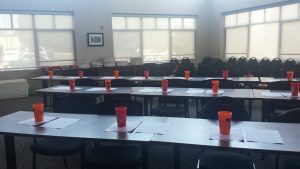 Almost every single attendee signed up to do a ride along with Seminole Trail and expressed interest in taking fire academy this fall. We hope that the large turnout results in us being able to supplement our membership and allow these enthusiastic students to give back to the Charlottesville community! While the fall open house is our main recruitment event of the fall, we are always looking for new members. So, if you weren’t able to make the open house but are still interested in volunteering at Seminole Trail don’t hesitate to visit our “Join Us” page or send us an email at join@stvfd.org. Come see how you can make a difference in your community!